The BMW X5 may not have kicked off the premium SUV fad, but it was one of its early adopters that refined it. If you wanted a high-riding family car back in 1999 choices were limited to the Range Rover or Mercedes ML, both of which drove with as much on-road sophistication as a circus cart. Then came the E53 X5. It was big, yes, but it was also the first time that a large SUV drove with any resemblance of a ‘normal’ car, in the process creating a new yardstick that others had to match. Now, four generations later, the all-new X5 exists in an ecosystem that has not only adopted the SUV, but relishes it. Problem is, the X5’s rivals now number in double figures, so life won’t be easy for the all-new model. To compete, the new X5 has been thoroughly redesigned, comprising an all-new interior, updated engines and this bold new skin. A flagship M Performance M50d model is also back (until the next X5 M inevitably arrives), featuring a fascinating new quad-turbocharged straight-six engine. But is the original still best? The new X5 starts at $72,925 for the entry-level 30d in xLine trim, with a petrol 40i model also available with an identical spec for $74,690. The standard equipment list is vast at this level of SUV (there are four different SUV models below and still two above, just within BMW’s range, remember), so includes leather-trimmed sports seats, a synthetic leather dashboard, two 12.3-inch hi-res displays (one forming the iDrive infotainment system and the other the instrument dials), a powered tailgate, LED headlights and more. The exterior styling is arguably the most dignified of the range, with black lower bodywork and wheelarch extensions, mixed with a use of chrome and satin silver finishes. It also rides on a fairly restrained 19-inch wheel and tyre package. Now standard for the first time on an X5 is air-suspension, applied here on both axles rather than just the rear like some rival manufacturers. An optional xOffroad package is also available, adding to the air-spring’s functionality by being height adjustable, along with the addition of various off-road modes. 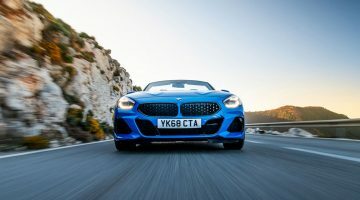 M Sport models add a further $4500 to the price, bringing 20-inch wheels and tyres, more aggressive styling elements, further application of body-coloured parts around the wheels and lower bodywork, as well as different finishes to the interior and an M Sport steering wheel. Like many manufacturers, most of the most popular options are now bundled within option packages. Trundle through these and you’ll find everything from laser-assisted headlights, a head-up display, comfort access and more, but as usual on a German car, the options list is not limited to just packages. Highlights on the individual options list include a Bowers and Wilkins stereo, rear seat entertainment and a panoramic sunroof. 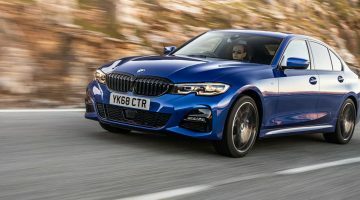 It’s the dynamic options that are of most interest to us, though, with an M sport rear differential available on top of a active anti-body roll system and rear-wheel steering. Topping the local range till the M Division models arrive next year is the M50d, featuring the aforementioned quad-turbo diesel engine and a raft of other dynamic additives. Sitting behind those huge grille slats are a selection of three turbocharged in-line ‘six’ engine options. The sole petrol model generates 335bhp and will reach 100kph in just 5.5sec, topping out at 243kph. Petrol models have yet to drive, but when we’ve sampled the same engine inside a BMW 540i, the smooth, linear response will make it a fine, if thirsty option. The bulk of sales will undoubtedly still be made up from the 30d, which produces 261bhp and a more stout 458lb ft of torque. It’ll reach 100kph in a still impressive 6.2sec, though, while using less fuel in the process. Diesel engines may be about as popular as acid-wash jeans right about now, but when talking about a reasonably sensible two ton-plus SUV, petrols and hybrids still have a way to go before becoming the engine of choice. As a result, it’s not surprising to see that BMW has placed the biggest emphasis on its 30d and 50d power units, with a sole 40i petrol offered just for those who really don’t like acid-wash.
We drove both diesels on test, and found them to be impressively hushed and flexible throughout the rev range. The 30d’s 261bhp is impressive enough, but it’s the torque that keeps the hulking great body moving with plenty of vigour. It’s not exactly brisk, but it never feels underpowered, like it wouldn’t be hampered by a full load or trailer on the back. The engine’s calibration with the eight-speed ZF gearbox is also very impressive, mooching seamlessly between gears, without any of the hesitation that so often inhibits smooth and urgent progress in modern diesels. It’s the M50d that steals all the headlines here though, with its quad-turbocharged 3-litre straight-six that produces those impressive power and torque figures. Layed out as two separate sequential twin-turbo systems, the journey of compressed air within the M50d’s engine bay is about as convoluted and confusing as Alice’s in Wonderland. At low rpm the first two small turbochargers quickly spool to spike the torque curve as quickly as possible. Then, at around 2000rpm, the larger turbos begin to spin, taking over from the smaller units right up to around 4500rpm, when the torque and power start to drop off their plateau. Although it sounds massively convoluted, from inside it’s nearly intangible that so much is happening in front of you, rather you just feel a great surge of power. Unfortunately, BMW’s M Performance department has decided that a bit of M5-style sound generation is also required when set in Dynamic mode, masking the engine’s not entirely unpleasant sound by overlaying it with fake noise pumped in from somewhere around your right knee. This is not well executed, or indeed necessary, as from outside the X5 M50d sounds surprisingly edgy, in a big-diesel kind of way. What the M50d does is straddle the line between a sensible SUV engine option (if there ever was one) and the mad petrol-powered flagships that seem to make no sense outside of major British Petroleum shareholders. 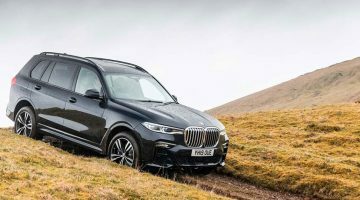 The first X5 really was the first high-riding SUV with any semblance of saloon car-like handling, but as the market has expanded, the X5 now instead merely errs on the side of sporty. It must be said – the new X5 is just too big to be a giggle on twisty roads; refined, sophisticated and capable, yes. But fun? Not so much. Once you climb a ladder and peer beyond the X5’s mass, you’ll find a steering set-up that is entirely free of any tangible feel, but it’s accurate and relatively confidence inspiring. Available as an option on all models is a rear-wheel-steering system, also known as Active Integral Steering in BMW speak. It does seem to have a positive effect on the car’s agility. You find yourself applying less lock than you imagine necessary. I would hesitate to go as far as calling it agile, but more agile than expected seems to be a fair assessment. Start throwing the car around and its air-suspension system doesn’t fall over itself either, although all of the cars we drove on test were fitted with adaptive dampers. All models ride well, especially considering the enormous wheels on offer, but go to 21- or 22-inch wheels and there is a brittle edge to the ride quality, owing to the lack of sidewall holding all that weight up off the tarmac. Be greedy with the power and the BMW’s slight rear-bias becomes more apparent, with a tenacious front end that will hold on to the tarmac longer than the rear seems willing, although it never quite achieves the transparent body control that keeps the Porsche Cayenne on a large SUV pedestal, nor is it anything close to throttle adjustable. I liken it to seeing a hippopotamus run at full speed towards one of its foes: powerful and controlled, but only just. In reality, the X5 drives 75 per cent as well as a 5-series saloon, it’s just a shame that means so much less than it did 20 years ago. BMW claims 4.9L/100km for the 30d, an impressive number considering its more than two-ton weight figure. The M50d still cracks 6.8L/100km over the same combined route, although we managed mid-30s in the 30d and high 20s in the M50d on test. This might have something to do with constantly flooring it in a high gear just to feel the surge of torque, but if you’re interested in buying an M50d chances are you’ll feel inclined to do the same. Petrol 40i models are rated at 8.5L/100km, a number you’ll never reach anyway. Viewed in isolation, you might be well impressed with the new X5’s interior. BMW is debuting a new interior architecture, infotainment software and driver interface components in the new X5, which has already spread to the incoming 8-series Coupe, Z4 and 3-series. Immediately obvious is the replacement of BMW’s traditional round dials, replaced for BMW’s new active driver information display, with new graphics and more functionality. Unfortunately, BMW has perhaps forgotten to recognise the reason round dials worked so well, as the new rev counter and speedometer, which arc around the perimeter of the display are almost completely illegible at a glance. BMW says that it has been designed as such to try to integrate as much other driver information as possible into the display directly in front of you, but there just isn’t enough definition between your actual speed, the speed limit and your cruise control speed setting to find it in your peripheral. BMW offers an optional head-up display system which goes some way to fix the issue, but it’s not standard, and when set up with all the available information is just as illegible. The rest of the dash works significantly better, with main controls grouped on the main of the dash, and new climate controls set between the main vents. This is a slick and easy-to-use layout that works far better than the climate functions of older BMWs like the current 5-series. But along with this simplified dash, the X5 suddenly becomes very sensitive to colour and trim. The optional ‘Individual’ leathers and trims of our test cars looked lucious and expensive, but when replaced with black plastics and lesser-quality leathers, it might turn out to be a little low-rent. A special mention must go to the crystal-appointed gear selector and iDrive controller. Although it is a matter of taste, the cut-glass tumbler look, combined with an internal glowing insignia is definitely a strong statement. Unfortunately, the bit of plastic that your fingertips actually come into contact with is a cheap-feeling, textured section, which is considerably worse to touch than a normal leather selector. The iDrive, or BMW Operating System as BMW would prefer us to call it now, is still better than Merc’s units, but perhaps less intuitive and glamorous than the twin-touchscreen set-up found in the Audi Q8, or the massive 15-inch screen in a Volkswagen Touareg. With some reservation about falling too sharply into the ‘design is subjective’ argument, it’s definitely clear that BMW is not playing coy with numerous design cues that have formed the backbone of BMW design for the past 80 years. You might argue the same elements were messed with back in the Bangle days, but this new wave of design is not based on an intellectual, avant garde aesthetic, rather a more offensive one (in both senses). The sheer size doesn’t help, but it’s only really in comparison to the even bigger X7 that the X5 looks appropriate. In reality, very few large SUVs could be considered attractive, but the oversized kidney grille, fussy lower surfaces and wobbly surfacing do not help the new X5’s case. Its bold, dramatic and not entirely original adaptation of contemporary design trends without much sensitivity to its own history is a real shame in our eyes. In its defence, the X5’s design will likely attract as many new buyers as turn them away, such is the SUV world we live in, but that still doesn’t make the grille any smaller. Previous ArticleJeep Grand Cherokee Trackhawk review – can it out-muscle a Lamborghini Urus?